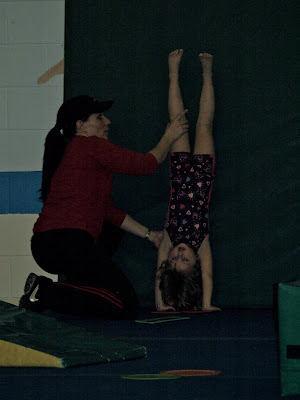 Zoe has been taking gymnastics for a little while now. She really loves it... and never seems to stop tumbling and flipping around now. The girl sits upside down in her chair more often than right side up. The parents usually aren't able to go in to watch the classes but once in while we get invited in. Zoe is very serious about her stretching. 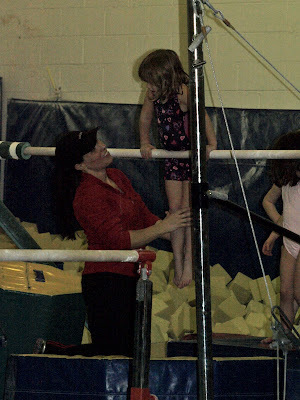 They teach the girls to balance on the beam. They also put bean bags on the beam to teach the girls to balance, jump over the bag, and balance again. Zoe's had a really had time learning this. She's finally getting the landing though. And Miss Kim is FABULOUS! We met her when Zoe and I started doing the Gym Baby class when Zoe was 6 months old. LOVE HER! Getting ready to do a "donkey kick" on the low beam. You really can tell Miss Kim loves her job. Handstands! If you can... just imagine this same position in our TV room with her feet flopped over the back of her big red chair. It's how we've gotten used to seeing her. Zoe loves to do cartwheels now. I imagine it won't be long now before those legs are straight up in the air and she's cartwheeling around the back yard. 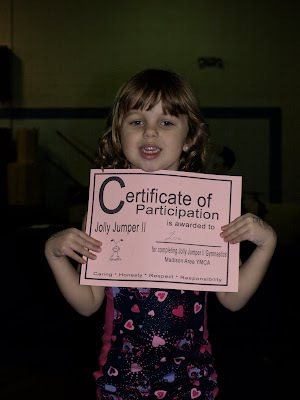 My little Jolly Jumper... she's becoming quit the gymnast!